CanadaGenealogy, or, 'Jane's Your Aunt': Finally - my Newdale Manitoba Family History Site. Finally - my Newdale Manitoba Family History Site. You "Auto" Be With Me In Newdale. 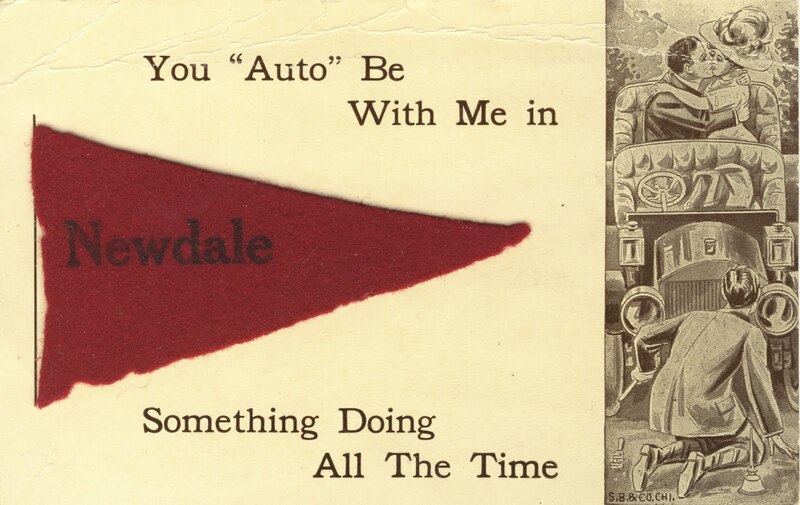 Something Doing All The Time, novelty postcard with felt pennant. Addressed to: Mrs. Chas Love, Shoal Lake. Man. Private collection; all rights reserved. Well, I've finally done it - started up a Newdale, Manitoba genealogy website. This is for my grandmother, my Na, Amy Estella (Irwin) Scott and her daughter, my mum, Muriel (Scott) Rogers - both of them were born in Newdale - and for my children too, of course. Don't memorize that though as I expect I'll be moving it soon enough and maybe changing the name. I'll be gradually posting my Newdale related family photographs and information there, as well as my collection of historical Newdale snippets and more. I've connected with a number of cousins on the 'Net so far; perhaps I'll meet a few more! Glad you have your family site now, I am still making ours.